Have you started your annual spring cleaning routine yet? As you begin to refresh and renew your home, consider all the ways that cleaning and organizing with wall beds and cabinet beds can make the process smoother. They can also help put your entire life in order with all their unique and useful features. 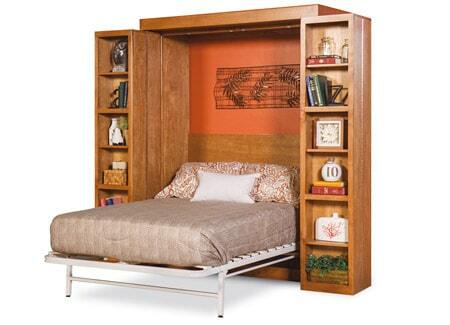 Here are some common problems and easy fixes using amazingly functional wall beds and cabinet beds. Are you an avid reader who still enjoys cracking open a physical book as opposed to reading an e-book? Then chances are you have a large collection that needs cleaning and organizing. We know some of you bibliophiles refuse to cull your collection, but if you can get rid of a few, the problem of where to store them all gets smaller. Let’s face it, paperbacks and anything but out-of-print editions probably aren’t worth saving, especially if you’ve already read them and have no plans to do so again. Another idea is to be a “book fairy” and leave selected titles tied with a ribbon in places like medical offices, grocery stores, etc. or simply give them as gifts to friends. You could always try to sell some of your books, hardbacks in particular, at a book resale shop if you’d like to earn a bit of extra cash. But we’ve also got an easy solution that allows you to combine book storage with a comfortable guest bed in your extra room: the Library Murphy Wall Bed. This handsome wall bed is disguised by a set of bookcases that pull away from the middle of the cabinet to reveal the mattress stowed inside. Here’s another thing that we tend to encounter a lot of when spring cleaning and organizing: papers, photos, cards, notes. Unfortunately, there is no better solution in regard to reducing these items other than to go through the entire stack one by one. The good news is that you can organize the pieces and papers as you go. Make one stack for photographs, one for notes that need to be followed up on and a third destined for the recycle bin or shredder. Once you’ve got them all organized into piles, find a home for them. We suggest purchasing bins or baskets (use one made with a special liner for photographs) with each clearly labeled as to the contents. In this regard, cabinet beds are a big help. 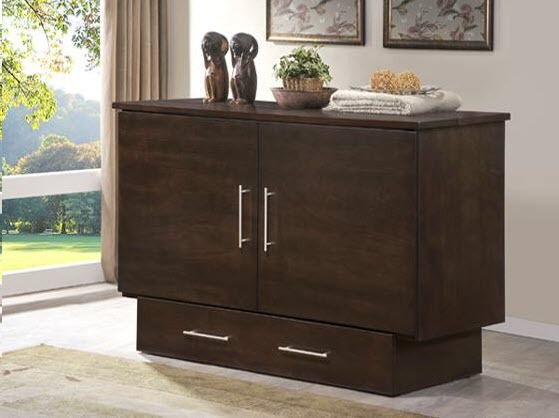 Each of our handsome, all-hardwood cabinet beds is equipped with a large storage drawer underneath the cabinet. They also have a roomy shelf at the top of the cabinet. Either place would be a great location for bins or baskets. Here’s another area where stuff just tends to accumulate: our tax receipts, old devices, tech tools and home business paperwork. We’re talking about things like old cell phones, laptops and printers in addition to business receipts, tax forms, client files and the like. When it comes to cleaning and organizing your outdated devices, look online for places in your area where you can turn them in. Many women’s shelters take old cell phones. Often, municipalities host electronics recycling days; clean the data from yours and set them aside until you can safely get rid of them. 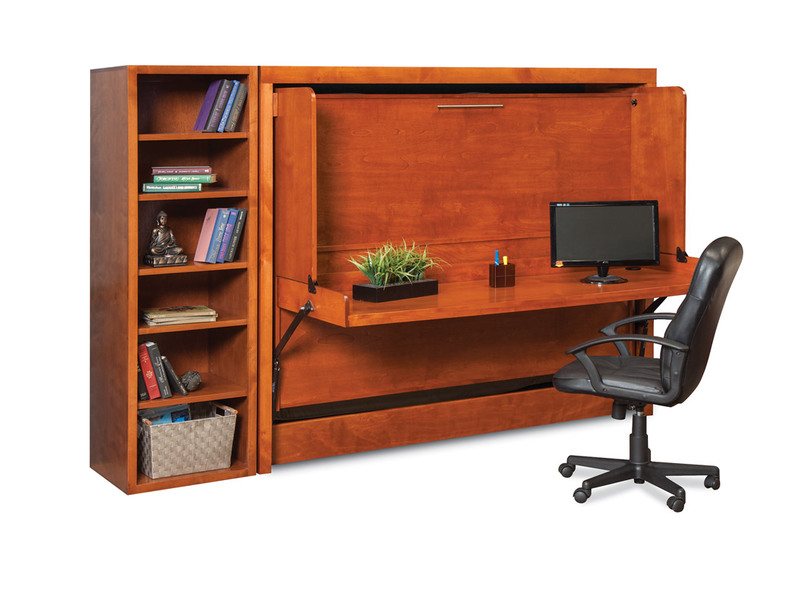 This horizontal Murphy bed with desk would fit almost anywhere. When it comes to paperwork, files and receipts, now is the perfect time to organize your home office. Take a look at this wall bed with desk. Not only does the wood cabinet hide a bed that folds down over the work and devices in use on the attached desk, it includes side piers with a bookcase, file storage, drawers and more. This year, try spring cleaning and organizing with wall beds and cabinet beds to not only double your home’s space, but keep it neat and orderly.